A boy learns of his dragon past; a girl has known of hers for years. 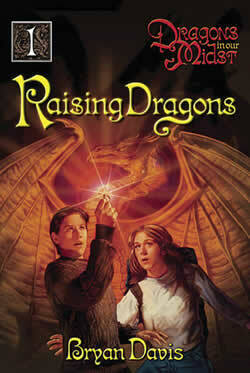 Book 1 in the Dragons In Our Midst middle-grade contemporary fantasy series, by Bryan Davis. A boy learns of his dragon past; a girl has known of hers for years. The kids at school call Billy Dragon Breath for good reason. His breath is bad! It isn’t the normal, morning-mouth bad; it’s the hot-as-fire, don’t-you-dare-get-near-me bad. Trouble erupts when his hot breath sets off the fire sprinklers in the boy’s restroom at school, and his parents learn that they’ve kept their secret for too long. Book 1, Dragons In Our Midst series — middle grade/young adult contemporary fantasy. This is a pretty good book. The characters are believable, the story is well-paced. I enjoyed meeting the two kids and their nifty dragon-esque powers, and the bad guy, the Dragon Slayer, is suitably nasty and supernatural by turns. I did have a problem with the boy’s sudden, inexplicable hatred of his father, which I didn’t understand, and also the book’s sudden ending, prompting you to buy the next book. (Which wasn’t out when I read this one). On the whole, though, this is a pretty good read for pre-teens looking for some solid fantasy. Get the whole series at once, though, because the ending of book 1 will leave you dissatisfied and wanting more.